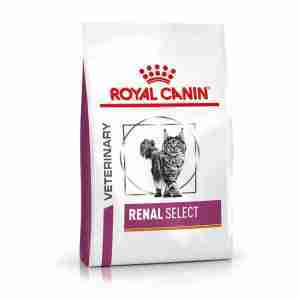 Royal Canin Renal Select Feline is a cat feed that helps support chronic or temporary renal insufficiency. Similarly, it helps reduce oxalate stone formation, through its low levels of calcium and vitamin D.
Moreover, it is recommended that a veterinarian’s opinion be sought before use or before extending the period of use. Initially feed renal special for up to 6 months in cases of chronic renal insufficiency and reduction of oxalate stone formation. For cases of temporary renal insufficiency a period of 2 to 4 weeks feeding is recommended. CKD dietary management, formulated to support renal function in case of chronic kidney disease. Contains EPA and DHA, a complex of antioxidants and a low phosphorus level. Reduces renal workload, increased kidney workload may induce uremic crisis. An adapted content of high quality protein helps reduce kidney workload. Easy to order. Prompt delivery . For cats suffering kidney disease. The small packets are ideal because cat with chronic kidney disease quickly change their requirements. It is well known that they require frequent changes in the cat food provided. My elderly cat has kidney problems and will not eat any of the usual renal diets,but she loves this.Success at last.Hope they produce more varieties of Select.